This is the title of a magnificent study by Susan Whyman. 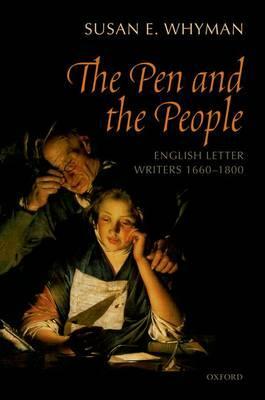 Its subtitle is English Letter Writers 1660-1800, and the book was first published in 2009 by Oxford University Press. It analyses a host of letters from the period, but focusses on six letter collections by people from the middling sort, as they would refer to themselves. The study shows that letter writing was developing into an important medium for people to get on in life, for men and women alike, to express literary ideas and religious thoughts, and that epistolary fiction and private letter writing are intricately intertwined. Read the abstract on Oxford Scholarship Online, but more than that, read the book itself! The book is a social history, but its many quotations show that the letters used would be fascinating material to analyse linguistically. One example has been discussed on the Robert Lowth blog. This entry was posted in 18th-century letters and tagged Robert Lowth, Susan Whyman. Bookmark the permalink.